Can a new theory in neuroscience explain spiritual experience to a non-believer? New York, USA -- September 25, 1974. I am on the delivery table at a maternity hospital run by Swiss-German midwives in Bafut, Cameroon. My daughter, Abi, arrives at 1:30 a.m. but because no bed is available, I lie awake in the kerosene lamplight waiting for the dawn. Mornings in this West African highland are chilly and calm. Swirls of woodsmoke carpet the ground. On a nearby veranda, the peace is shattered by the high-pitched ululations of a young woman. Her arms are raised above her head, bearing a tiny bundle. It is her dead infant. As she paces up and down, grieving, I reach for my sleeping newborn and hold her to my body, shaking. The next morning, as dawn breaks, I am in a private room and again the ululations pierce the stillness. But this time the sounds convey elation. A grandmother walks the veranda, holding newborn twins -- male firstborns -- in her arms. A birth, a death, more births. So close. Palpable. These transformative events somehow conspire to propel me, while sitting up in bed, into an altered state of consciousness. I am floating in a vast ocean of timelessness. My right hand holds my mother's hand. In her right hand is her mother's hand, which is holding her mother's hand and so on into the depths of time. My left hand holds my daughter's hand, which is holding her daughter's hand, who is holding her daughter's hand and so on into an infinite future. Time stands still. My mind and body expand in a state of pure ecstasy. Again, I am floating. The spiritual experience envelops me -- for how long I don't know -- until I come back into my body and observe my baby by my side. For the next five weeks, I walk around in this rapturous state of timelessness, of now, no past, no future, only now. I remember thinking, "Wow, if I meditated for thirty years I'd be lucky to feel this way." It all vanished when I came down with malaria and shortly afterward moved back to the United States. People who believe in a supreme being might say that I had been in the presence of God or some manifestation of God. Or that I had touched Nirvana, that state of perfect peace, without craving, filled with transcendental happiness. But I disavow the idea of a personal God, do not believe in a soul that lives on after death, and think that religion -- defined as a set of cognitive, linguistic beliefs and creeds that are highly culture specific and historically contingent -- is irrelevant to my experience. So if this mindboggling spiritual experience came not from an encounter with God, what could explain it? I think it can, although the research is in an early stage. A stunning new description of how the human body and brain communicate to produce emotional states -- including our feelings, cravings, and moods -- has all the elements needed to explain how the human brain might give rise to spiritual experiences, without the necessary involvement of a supernatural presence, according to Dr. Martin Paulus, a psychiatrist at the University of California in San Diego who is also a Zen practitioner. Called interoception, it offers a radically new view of human anatomy and physiology based on how information from the body reaches the brain and how that information is processed uniquely in humans. The subjective awareness of our emotional state is based on how our brain represents our physiological state, says Dr. Arthur D. Craig, a neuroanatomist at the Barrow Neurological Institute in Phoenix and leading researcher in interoceptive processes. "If there is any way to objectively measure a subjective state," he says, "this is it." Thus the brain's centers that integrate sensory reports from the body are found to be highly active in studies of drug addiction, pain in oneself, empathy for others, humor, seeing disgust on someone's face, anticipating an electric shock, being shunned in a social setting, listening to music, sensing that time stands still -- and in Tibetan monks contemplating compassion. In this view, spirituality -- an emotional feeling from the body, a sense of timelessness, a suspension of self and dissolution of personal boundaries -- can be explained in terms of brain physiology, which means, of course, that it is subject to experimentation and manipulation. The idea that the brain tracks moment-to-moment fluctuations in physical sensations from the body is well over a century old. Moreover, the feelings we sense from these changes is the definition of an emotion. William James, the American psychologist, famously described the physical essence of emotions in 1884 when he stated that we run from a bear not because we are afraid. We run because we have a racing heart, tight stomach, sweaty palms, and tense muscles. But the neuroantaomical details of how such signals from the body produce feelings and motivations have only recently been worked out. It turns out that the brain exploits several pathways for knowing what the body is up to. One involves touch. Human skin contains receptors for gentle pressure, deep pressure, sustained pressure, hair follicle bending, and vibration. When one of these touch receptors is activated, fast moving signals are sent to the brain?s primary touch map, where each body part is faithfully mapped out. A touch on the arm activates the brain?s arm map. A touch on the cheek activates the brain's cheek map?and so on for every inch of the human body. But according to Craig, skin, muscles, and internal organs -- including heart, lungs, liver, and gut -- contain other types of receptors that collect an ongoing report about the body's felt state. Thus there are receptors for heat, cold, itch, tickle, muscle ache, muscle burn, dull pain, sharp pain, cramping, air hunger, and visceral urgency. There are even receptors for sensual touch -- the kind one might give to a baby or lover -- located mostly on the face and inner thigh. This collective interoceptive information represents the condition of the body as it strives to maintain internal balance, Craig says. "For example, you think of temperature as being external to the body and related to touch. The sidewalk is hot. The floor is cold. But temperature is not allied with touch," he says. "It is an opinion on the state of the body. If you are hot, a cool glass of water feels wonderful. If you are cold, the same glass of water can be unpleasant. If you are chilled, a hot shower feels great. If you are too warm, a hot shower is unpleasant.? Whereas touch signals for pressure and vibration are carried on fast acting fibers to the primary touch map, interoceptive information is carried up the spinal cord and into the brainstem via a wholly different network of slow acting fibers, Craig says. Moreover, this information about the body's felt state goes to a different region of the brain called the insula. The insula -- a prune-size structure tucked deeply into the brain's upper mantle, one in each hemisphere -- is devoted to feeling interoceptive sensations from the body. It is connected to a nearby motor area, called the anterior cingulate, which produces actions responding to those feelings. Both the insula and anterior cingulate are wired to other structures, notably the amygdala, hypothalamus, and prefrontal cortex, which allow the brain to make sense of what the body is telling it. Humans exploit this wiring to generate complex emotions that other animals cannot fathom, Craig says. Rats, cats, and dogs, for example, have feelings from the body but they do not pass the information to the insula. It goes to simpler control centers elsewhere in the brain. "This means animals cannot experience feelings from the body in the way that you and I do," Craig says. "They have primary emotions like fear, sadness and joy but not like you or me." Monkeys and apes do pass interoceptive signals to the insula, but in comparison to humans, their insulas are far less developed. Their emotions are more nuanced than a dog?s but more rudimentary than a human?s. They do not, in all likelihood, have spiritual experiences. We humans, Craig says, are anatomically unique in how we collect feelings from the body. Like our primate cousins, we gather information about ongoing physiological activity from the body and represent it in both insulas. But then we take an extra step. Our felt body senses are re-represented in the right frontal insula as social emotions. (Our frontal insulas are huge compared to other primates.) Re-representation means that a sense of blood rushing to the face might be experienced as embarrassment. Or the sense of a swelling heart is understood as pride. Or the sense of floating in bliss is felt as spirituality. Social emotions --everything from atonement to jealousy to pride to spirituality -- are a hallmark of humankind, Craig says. Interoception is what allows us to feel them. Social emotions are a mixture of positive and negative elements that activate the right and left frontal insulas differently, Craig says. In general the right insula is involved in energy expenditure and arousal whereas the left insula is associated with nourishment and love. Thus when empathy involves a challenge, the right insula is more active than the left. When empathy involves compassion, the left insula is more active. When we listen to music we don't like, the right insula is more active. When we listen to music we love, the left insula is turned on. Women who report greater satisfaction with their orgasms show increased activity in the left frontal insula. And when a mother gazes at her infant, her brain is bathed in two hormones -- oxytocin and vasopressin -- that are released during childbirth, lactation, and when people trust one another. Responding to this sense of pure nourishment, the left insula lights up. Of course, spiritual experiences involve more than bliss. Physical boundaries seem to dissolve. The ego vanishes. Space expands. Awareness heightens. Craving ceases. Time stands still. Specializations in human brain circuitry can also explain these phenomena, Craig says. As the right frontal insula collects information from the body, it builds up a set of so-called emotional moments through time. An emotional moment is the brain's image of the "self" at any point in time and is, he says, the basis for our subjective emotional awareness. Usually, our awareness involves many simultaneous events. But sometimes, in extraordinary moments, our awareness is heightened. For example, if someone is in a car accident, ten seconds can feel like a full minute. Everything seems to unfold in slow motion. This is because heightened awareness produces a larger emotional moment -- so large that it alters the perception of time. The sensation of floating out of one's body can be traced to another brain region in the parietal lobe called the right angular gyrus, which is essential for locating ourselves in space, according to Dr. Olaf Blanke, a neurologist at University Hospital in Lausanne, Switzerland. When this area is stimulated with an electrode, essentially shutting it down, people have vivid out-of-body experiences, he says. They feel as if they're floating on the ceiling, looking down at their bodies. When the electrode is turned off, they go back into their bodies. Out-of-body experiences naturally occur when activity in the right angular gyrus is suppressed for any reason, Blanke says. When people are in shock, say after an accident, a relative lack of blood flow to this region can easily produce sensations of floating outside one's body. Finally, the right hemisphere contains circuits for recognizing and feeling the self. Imaging experiments show that three regions -- the medial prefrontal cortex, precuneu, and posterior cingulate cortex -- light up in imaging studies when subjects think about themselves, their hopes, and aspirations and retrieve episodic memories related to their lives. The sense of being -- me, myself, and I -- is located in this circuit, according Dr. Marco Iacoboni, a neuroscientist at the University of California, Los Angeles. When the circuit is suppressed with a device called a transcranial magnet, people can no longer recognize themselves in a mirror, he says. 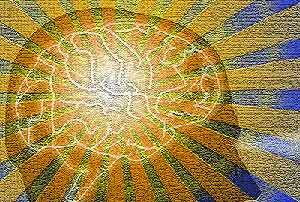 Given these brain circuits, it is possible to make predictions about the neurophysiology of a spiritual experience. The right angular gyrus or right parietal lobe should go offline, so that the body floats outside itself. Areas of the right brain should deactivate, including the anterior cingulate and frontal regions, allowing the self or ego to float free. Finally, the left frontal insula should become especially active, engendering a sense of pure bliss and love. Recent neurological studies of religion and meditation support many of these predictions. At the University of Wisconsin in Madison, psychologist Richard Davidson is studying Buddhist monks as they meditate. In his most recent study, the monks focused on compassion, concentrating on how to alleviate suffering. There was a dramatic increase in insula activity, Dr. Davidson says, as the monks reported a sense of love and compassion. At the same time, their anterior cingulates (the action part of the interoceptive circuit) showed less activity, suggesting the monks attained a state of awareness without motivation. In a study of "vipassana" meditation, where one?s field of awareness is expanded to include anything that comes into consciousness, Davidson found that practitioners showed a strong decrease in areas of the right brain associated with the self. According to Dr. Sara Lazar, a neurobiologist at Harvard University, insular gray matter is bigger in experienced meditators. Like a muscle, it can be challenged to grow bigger and stronger. Paulus, the psychiatrist who is a Zen practitioner, says that the focus on interoceptive experiences, such as concentrating on the breath, is a central aspect of meditative practices in certain Zen schools. The physiological representation of the self in the brain and spiritual experiences that transcend the self are closely connected. At the University of Pennsylvania, Dr. Andrew Newberg, director of the Center for Spirituality and the Mind, studies Buddhists using a brain-imaging tool called single photon emission computed tomography. The method is not suited for looking at the hard-to-reach insula, he says, but it does show decreased activity in the parietal lobe, which is involved in spatial orientation. When the monks meditate, he said in a 2001 paper, they perceive the dissolution of personal boundaries and a feeling of being at one with the universe. Newberg also studied Franciscan nuns while they repeated a prayer and experienced being in God?s presence. He noted a similar decrease of activity in the parietal lobe, which suggests that the nuns experienced an altered body sense during prayer. The parietal lobe uses sensory information to create a sense of self and relate it spatially to the rest of the world, he says. When they pray, they lose themselves. At the University of Montreal, psychologist Mario Beauregard is studying the neural correlates of religious, spiritual, and mystical experiences in Carmelite nuns. When the sisters reported a sense of union with God -- of having touched the ultimate ground of reality, of feeling peace, joy, unconditional love, timelessness, and spacelessness -- their insulas lit up along with several other structures (the caudate nucleus, parietal lobe, and portions of the frontal cortex). Such studies do not, of course, prove or disprove the existence of God. The fact that many brain regions, including interoceptive regions, light up when subjects are asked to contemplate religious feelings or to meditate is but one aspect of these experiences. Beliefs, which are learned from family and culture, create meaning. And what about my experience? I was bathed in oxytocin and vasopressin, hormones that propel people into feelings of connectedness, trust, and affiliation. I felt love for my newborn. I was frightened by the dead infant on the veranda and elated by the birth of the twins. Could these feelings from my body -- the shock, the shivering, the sensual touch -- have pushed me into an altered state of consciousness? As I breastfed my daughter, did the continued release of maternal hormones somehow maintain the state of bliss for another five weeks? I cannot prove that neurochemistry and interoceptive processes fully explain that extraordinary event, but they are, to my mind, sufficient. Some might argue that a supernatural agent entered my body without my knowledge -- but there is not a shred of evidence for that claim. I prefer a biological explanation. In fact, I believe that every person is capable of achieving an equivalent state of sublimity without invoking God. There is nothing mystical about it. Interoceptive awareness varies with individuals. Some will be more prone to such experiences than others. Some are better at reading signals from their bodies. Hormones like oxytocin, brain chemicals like serotonin, and drugs like ecstasy play a role in producing these phenomena. Indeed, drugs are used to induce spiritual experiences the world over. I am sure of one thing. When people have a spiritual experience, like mine in Cameroon, they feel compelled to explain it. Human brains evolved to be belief engines, according to Lewis Wolpert, a professor of biology at University College London who studies the evolutionary origins of belief. "We want to explain everything," he says, "We cannot tolerate not knowing a cause." Thus, it seems, if our cultural upbringing has convinced us that God exists, we will interpret our blissful floating state as proof of a divine power. But if we doubt that God exists, we will turn to science and hope that researchers will eventually learn how to induce a spiritual experience in anyone who asks for it.